NEW YORK, Feb. 23, 2018 /PRNewswire/ — Forbes Travel Guide unveiled its annual Star Rating list, naming Baccarat Hotel New York as a new Forbes Travel Guide Five-Star Hotel. Baccarat Hotel New York is one of only two New York City hotels to receive the Five-Star award since 2016, and will be showcased with all the Star Rating recipients on ForbesTravelGuide.com. The Baccarat Hotel is owned by Sunshine Insurance Group, a comprehensive insurance financial group based in China that ranks among the country’s most successful insurance and investment firms. Sunshine Insurance Group purchased the property from Starwood Capital Group in 2015. 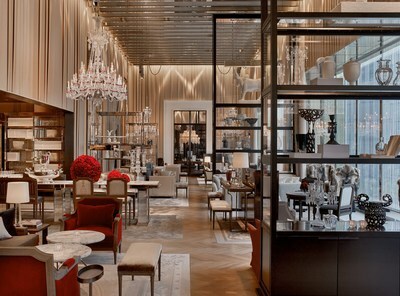 Baccarat Hotel New York is the first hotel and global flagship for the 254-year-old Baccarat crystal brand. Across the street from the Museum of Modern Art and steps from Fifth Avenue’s legendary shopping, the 114 guest rooms & suites designed by Paris-based, luxury design team Gilles & Boissier delight the senses with lavish finishes and artisanal attention to detail. Amenities include stunning salon-style spaces where guests enjoy breakfast, cocktails, afternoon tea and fare; a beautiful barrel-vaulted bar featuring Baccarat crystal stemware; Spa de La Mer, the first of its kind in the world, and a 55-foot marble swimming pool reminiscent of La Côte d’Azur. For more information, visit www.baccarathotels.com. SH Group, an affiliate of Starwood Capital Group, is a global hotel brand management company that provides Starwood with significant proprietary investment opportunities and maximizes returns on hotel investments in the firm’s dedicated hotel funds. SH Group owns the environmentally-focused 1 Hotels & Resorts brand and holds the Baccarat Hotel license, as well as other potential future hotel brands. Under the direction of President, Arash Azarbarzin, SH Group plans to continually expand, which will include bringing 1 Hotels to Los Angeles, Cabo and Haitang Bay.